We are endorsed to provide our services at one the “greenest” country shows in the UK. • “No Glass over the bar” policy. • All glass bottles dispensed into plastic or paper glasses. • COSHH guidelines on use & storage of chemicals & gas. • HACCP regulations are adhered to on beers, wines & spirits. • All staff trained in health & safety issues. Outbar use PET plastic bottles wherever possible for their premium products. These not only remove the safety problems involved with glass bottles but also reduce the amount of space needed to transport them around. They also weigh a considerable amount less so cost less to transport so are gentler on the environment. Outbar have full public liability insurance and extensive risk assessments are available on request. 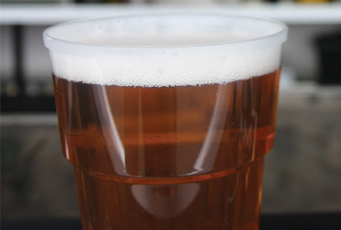 All of our bars are fitted with either state of the art sealed metered dispense or free flow pumps which we dispense into high quality CE stamped plastic glasses or reusable hard plastic or glass. This improves quickness of service & minimises queue & complies with all trading standards regulations. Outdoor bars and events management services.